The Fifth Annual Academic & Industry Intersection Conference, Medical Devices: Partnering for Innovations, will be held April 24, 2014. The event will focus on current obstacles and opportunities in academic and industry device collaboration for improving health and quality of life. 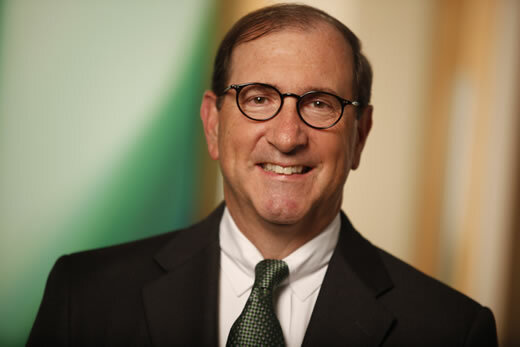 The conference includes the keynote address "Medical Technology Innovation: A Case Study for Collaboration," by Bill Hawkins, CEO of the Norcross-based Immucor, Inc.
Bill Hawkins, CEO of the Norcross-based Immucor, Inc. The event takes place from 8 a.m. until 1 p.m. at the Georgia Tech Research Institute Conference Center (250 14th Street, NW, Atlanta, GA 30318). This year’s conference includes the panel, Obstacles & Opportunities in Academic & Industry Device Collaborations featuring experts from C. R. Bard, Inc., EndoChoice, Georgia Institute of Technology, Emory University, Morehouse School of Medicine, and the Global Center for Medical Innovation. The conference will also feature the institutional collaboration success story of the Remotoscope, created by Wilbur Lam, MD, PhD, assistant professor, Wallace H. Coulter Department of Biomedical Engineering at Georgia Tech and Emory University. The Remotoscope is a pediatric medical device developed by Georgia Tech and Emory (with support from the ACTSI) that can turn any iPhone into an otoscope and send digital images directly to pediatricians. Academia, industry, not-for-profits, foundations, private investors, and government must work together to move scientific discoveries to practical applications. The 5th Annual Academic & Industry Intersection Conference seeks to profile successful collaborations as well as examine of how to navigate the commercialization process. The ACTSI is one of 62 medical research institutions working as a national consortium to improve the way biomedical research is conducted across the country. The consortium, funded through the Clinical and Translational Science Awards (CTSA), shares a common vision to reduce the time it takes for laboratory discoveries to become treatments for patients, and to engage communities in clinical research efforts. It is also fulfilling the critical need to train the next generation of clinical researchers. The CTSA initiative is led by the National Center for Advancing Translational Sciences at the National Institutes of Health. To learn more, visit . Georgia Bio is a private, non-profit association representing nearly 300 pharmaceutical, biotech, and medical device companies, universities, research institutes, government groups, and other business organizations involved in the research and development of products that improve health and well-being of people, animals, and the environment.